It is the form of silicon that is available to a plant. Silicon is the second most abundant mineral on earth, and is found in many forms in the soil, but only the monosilicic acid form is available to the plants. Microbial activity decomposes organic matter to form humic substances and causes reactions with Silicon to form organic forms of Silica which can be translocated to the plant and absorbed by the roots. Absorption of ZumSil® by plants is equivalent or superior to essential elements such as nitrogen and potassium and its accumulation in plants is similar to essential micronutrients such as calcium, magnesium, sulfur. What does Monosilicic Acid do for plants? A recent study was done on the effects of monosilicic acid and Azotobacter. Azotobacter is a bacteria that binds atmospheric Nitrogen and releases it in the soil as plant available Nitrogen. Depending on the environment, Azotobacter can supply the plant with 10-50% of its Nitrogen needs. This becomes cumulative with annual applications of monosilicic acid and the percentages increase. Without soluble silica, Phosphorous is not available. If plants are showing a Phosphorous deficiency, the lack of available Silicon may be the reason. Strengthens cell walls, thereby building resilience. The cell wall of a plant is a barrier that must be breached to get to what is located within. If the plant has stronger cell walls, pathogens are unable to gain a food source thereby stopping them from spreading. Silicon forms a protective armour plating on the plant leaf and gives the leaf a shiny surface that repels some insects. The leaf is also able to resist fungal spore germination and establishment. When disease begins, a plant will direct all available Silicon to the affected site to strengthen the cell walls. The leaves of a plant are responsible for taking energy from the sun and converting it into plant sugars. During warmer conditions, the plant is less likely to droop, therefore maximizing photosynthesis. Silicon is also a very important part of the structures within a plant that transport minerals. If Silicon is not present, the minerals are not effectively moved throughout the plant, resulting in pale spots and other discoloration. Buffers the plant from stress. Silicon can buffer a plant from stresses from the environment and from pests and disease. Environmental stresses include extreme weather, drought, cold, heavy metals and salt. 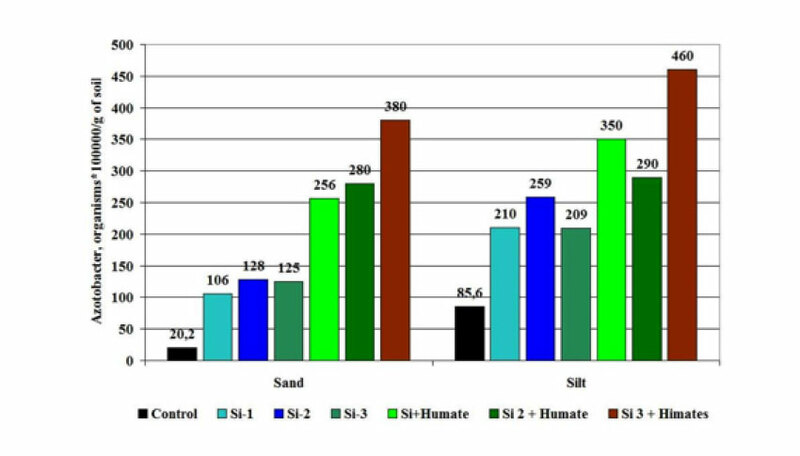 Silicon immobilizes heavy metals in the soil. Increases the sugar content and quality in plants. What is does in the soil makes other minerals available to the plant, and makes the carbon cycle more efficient which increases the Brix in the plant.